House Committee Cites Attorney General Holder For Contempt : The Two-Way The panel's decision next goes to the full House. It was a vote along partisan lines over whether the Justice Department has fully cooperated with the committee's investigation of the Fast and Furious gun trafficking operation. Acting along partisan lines, with a vote of 23 to 17, the House Oversight and Government Reform Committee voted this afternoon to hold Attorney General Eric Holder in contempt. 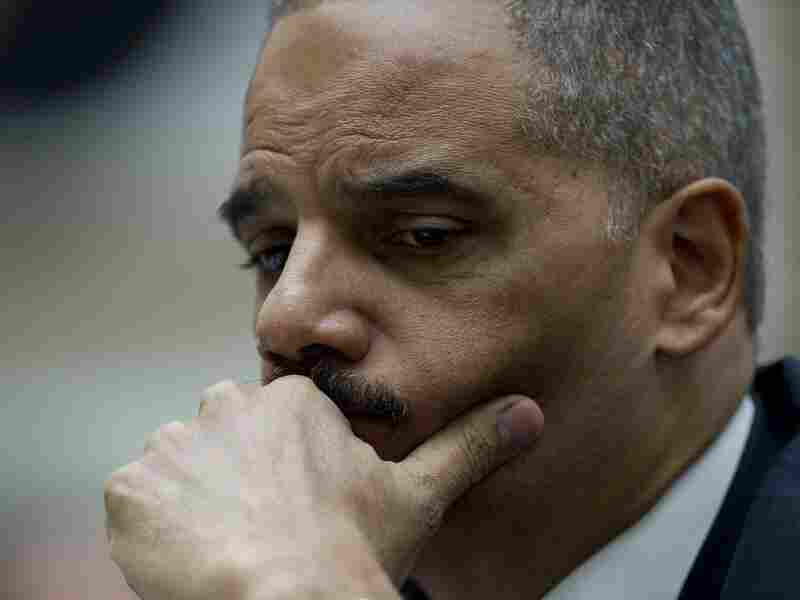 Republicans, who control the committee, say Holder's Justice Department has not turned over all the documents that the committee needs to see as it probes the so-called Fast and Furious gun-trafficking operation. And they want to know more about why the Justice Department initially told a senator that it had not pursued such an operation. Attorney General Eric Holder during congressional testimony in 2011. From the Congressional Research Service — Congress's Contempt Power and the Enforcement of Congressional Subpoenas: Law, History, Practice, and Procedure. Now, The Associated Press writes, the contempt citation will go to the full House for a vote — "although House leaders are not required to call it up for a vote. They could instead use the threat of that to pressure for renewed negotiations. Historically, at some point Congress and president negotiate agreements, because both sides want to avoid a court battle that could narrow either the reach of executive privilege or Congress' subpoena power." Update at 4:35 p.m. ET. : House Speaker John Boehner, a Republican from Ohio, and Majority Leader Eric Cantor, a Republican from Virginia, said the House will schedule a vote on the matter next week. "Fast and Furious was a reckless operation that led to the death of an American border agent, and the American people deserve to know the facts to ensure that nothing like this ever happens again," Boehner and Cantor said in a statement. In a statement, Holder said his department had made "unprecedented accommodations." He called the vote, "an election-year tactic intended to distract attention..."
This morning, as we reported, the White House exerted executive privilege as it informed the committee that it would not be delivering all the documents. That led to questions from Republicans about whether the White House is trying to withhold information about its own involvement in discussions concerning Fast and Furious. During today's committee meeting, Republicans made the case that the Obama administration has resisted efforts to investigate Fast and Furious and may have deliberately misled Congress. Democrats made the case that the GOP majority has gotten more than enough information and is largely ignoring a similar gun operation carried out during the Bush administration. "The agents in Arizona lost track of many of the weapons in Operation Fast and Furious. Two of the guns that 'walked' in the operation were found at the scene of the slaying of U.S. border agent Brian Terry."